The first known photograph, made in 1826. It shows the courtyard outside the room of Joseph-Nicéphore Niepce. by exposing them to sunlight through patterned masks. The most light-sensitive compounds are silver salts, and the photography that prospered in the second half of the nineteenth and throughout the twentieth century was based almost entirely on the use of silver halides. Practical photographic processes were devised in the 1830s by Louis-Jacques-Mandé Daguerre in France and by William Henry Fox Talbot in England. In Daguerre's method, a silver iodide-coated silver plate was exposed to light in a camera, whereby the exposed silver iodide was decomposed to metallic silver and iodine. A clear image was obtained by treating the plate with mercury vapor (which amalgamated the silver) and by rinsing it in a strong salt solution to remove the remaining silver iodide. A positive image could be viewed by holding this "Daguerreotype" in oblique lighting with a dark background, so that the amalgamated silver zones appeared bright and the silver plate appeared dark. Talbot's procedure consisted of washing paper successively in baths of saltwater and silver nitrate solution, thus depositing silver chloride in the fibers of the paper. 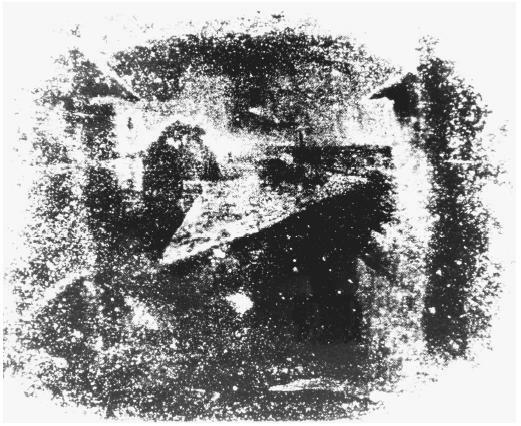 The still wet paper was then exposed in a camera until a dark silver image appeared in the light-struck regions, and the remaining silver chloride was removed by washing with a concentrated salt solution or a sodium thiosulfate solution. By waxing or oiling the negative sheet, Talbot made the paper transparent, and then by making an exposure of diffuse light through the negative onto another sensitized sheet, he produced a positive image. An unlimited number of copies of a photograph could thus be made from any one negative. Both Daguerre's and Talbot's methods were inconvenient because they required long exposures in the camera—sometimes as long as 60 minutes. In 1840 Talbot greatly improved his process. He found that a very short camera exposure (about 1/60 of that required to give a visible image) left an invisible "latent" image on the sensitized paper. The latent image was then "developed" into a visible image by treatment with a solution of gallic acid and silver nitrate. This modification, together with the negative/positive feature, made Talbot's process so superior that it has survived, in its general form, to the present day. The main difference between Talbot's process and modern photographic practice is that now the silver halide, in the form of approximately micron-sized crystals or "grains," is suspended in gelatin. The gelatin emulsion is coated as a thin film on glass plates or flexible sheets of plastic or paper. When a photon is absorbed by a silver halide grain, an electron is ejected from a halide ion and temporarily held at some site in the crystal. A silver ion can migrate to the site and combine with the electron to form a silver atom. The atom is not stable; it can decompose back into a silver ion and a free electron. However, during its lifetime, the atom can trap a second electron if one becomes available. If this second electron remains trapped until the arrival of a second silver ion, a two-atom cluster forms. This buildup of a silver cluster can continue as long as photoelectrons are available. The smallest cluster corresponding to a stable latent image speck is believed to consist of three or four silver atoms. Specks of this size or greater on the crystal surface can catalyze the subsequent action of a developer. 1. Exposure of the sensitive material, usually a gelatin emulsion of silver halides on a cellulose acetate film, in the camera. 2. Development in the darkroom by treating the film with a solution of organic reducing agents such as hydroquinone and N-methyl paraaminophenol. The reagents reduce to metallic silver those silver halide crystals that acquired latent-image silver clusters. The brighter the subject of a photograph, the darker is the image that forms in this development, so that one obtains a negative picture. 4. Washing away the dissolved silver salts and drying the negative. 5. Printing, that is, shining diffuse light through the negative onto a sheet of sensitive photographic paper (a gelatin emulsion on paper). 6. Darkroom development of the exposed paper using developer solution much like that used in the film development step. This step produces a positive image, in which the tones are like those in the original scene. 7. Fixing, washing, and drying the print as in the analogous film processing steps. 1. Exposure of the film in the camera. 2. Development of the negative image. 3. Dissolution of the developed silver image by treatment with an oxidizing agent. 4. Exposure of the remaining silver halide to light or to a chemical fogging agent. 5. Development of the silver halide, producing a positive image. 6. Washing and drying of the film. Reversal processing can also be accomplished using the Sabatier effect, in which the emulsion is given a brief exposure to diffuse light in the midst of development. Some emulsions, when subjected to very intense camera exposure, will yield a positive image by ordinary development—a process referred to as overexposure solarization. The silver halides are sensitive mainly to blue, violet, and ultraviolet light; hence, without sensitization, positive photographs reproduce all other colors as dark grays or blacks. However, by the addition of certain dyes to the emulsion, increased sensitivity to the other colors is obtained. Thus, "panchromatic" films, in which sensitivity is extended throughout the visible spectrum, are possible, and the resulting photographs are much more realistic than those obtained using old-fashioned red-insensitive films. The sensitization of emulsions to the three primary colors (blue, green, and red) is essential to conventional color photography. A common method for producing color prints uses a film containing three superimposed layers, each sensitive to one of the three primary colors. In the initial development, the deposition of silver is accompanied by the formations of a dye color complementary to the color sensitivity of the film layer. After removal of the silver and silver halides from all three layers, the image seen through the three layers is complementary in color to that of the original scene, that is, a color negative. This negative is then used to print a positive copy onto paper with similar layered emulsions, and development proceeds analogously to that of the film. In 1947 Edwin H. Land devised a diffusion transfer process for obtaining positive paper prints rapidly in the Polaroid Land camera. The negative is developed in the presence of a solvent for silver halides, which not only develops the negative, but also dissolves the nondeveloped silver halides. The silver halides dissolved out of the negative sheet are developed into an adjacent sheet (containing nuclei for development) to give a positive image. This principle was applied to color photography in the 1960s. Silver halide-based photography is being rapidly displaced by so-called digital photography, involving special cameras that contain no film, but rather charge-coupled devices (CCDs), consisting of rectangular arrays of millions of minute light sensors. Under exposure to light, each sensor produces an electric charge, and the enormous amount of information thereby produced (charge as a function of sensor position) is stored electronically as digital data in the camera. The CCD array can be reused indefinitely, the only limitation on the number of possible exposures being the amount of information that can be stored in the camera. However, this information can be downloaded from the memory bank of the camera to a computer, and the image can later be manipulated and printed out, for example, with an ink jet printer, a laser printer, or a dye sublimation printer. The CCD arrays are monochrome devices, but when combined with color filter arrays, they provide blue, green, and red data and thus yield color pictures. Carroll, B. H.; Higgens, G. C.; and James, T. H. (1980). Introduction to Photographic Theory. New York: Wiley. Coe, Brian, and Haworth-Booth, Mark (1983). A Guide to Early Photographic Processes. London: Victoria and Albert Museum. Rosenblum, Naomi (1984). A World History of Photography. New York: Abbeville Press.